Your plumbing system abides by the laws of gravity, pressure, and water, in its attempts to maintain a natural level. If you understand the basics of plumbing, it’ll help you with the basics back home. Your plumbing system contains two sub-systems. There is one that carries the freshwater into your house and another that the carries wastewater out of your house. It’s important that these don’t overlap because they serve two different functions. 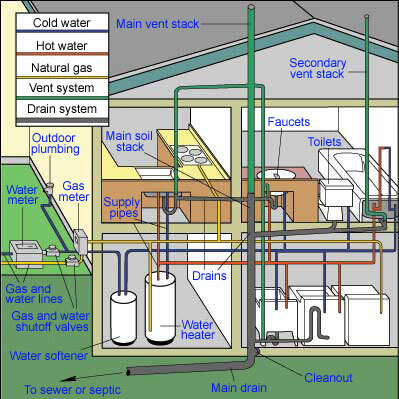 The fresh water comes into your home pressurized so it can travel around your home. As you bring the water into your house, there’s a meter that keeps track of how much water you use. The main water shutoff, or the valve that your water runs through, is generally located close to the meter as a result. You must be able to locate your main water shutoff or your house can be flooded in a plumbing emergency. If you find that the water doesn’t go too far from a confined area, you could turn off the individual stop valves. When you need cold water, the system is ready. Your hot water, on the other hand, goes through a different process because a line carries it to the water heater. The thermostat on the water heater maintains a temperature between 120 degrees F and 160 degrees F based on the owner’s choice. The 120 degrees F is usually enough for most purposes. After the water heater warms the water, the water line sends the heated, pressurized water to the needed fixtures. The drainage system doesn’t use pressure but instead uses gravity. Your waste matter leaves your house because of your drain system’s pipes all angling downward. Your waste, then, proceeds to either a septic tank or a sewage treatment facility. There’s more to the drainage system like vents, traps, and clean-outs. For example, the vents on your roof make air enters the drainage system. It helps the wastewater to flow properly and the traps to work well. You might wonder what is a trap? Your trap is a curved or S-shaped pipe located under a drain. If you ever want to have a peek at one, look under your sink or any other fixture. The water from a basin flows enough to pass the trap and enter the drainpipe, but some water remains in the trap, so sewer gas doesn’t return into your home. Your clean-out is a plug that gives you an easy way to take out any blockage that might back up a trap. To get the best out of your drain system, you have to make sure everything is working in proper order. You can examine your pipes better by entering your basement or crawlspace, but you can also save yourself the trouble by asking your local plumbing agency. The post Plumbing System: How Does It Work appeared first on Knoxville Plumbing | Plumber in Knoxville | Plumbing | Tennessee.